I went to work on this vintage trolley car parked illegally on Main Street outside Zula’s Coffee House in downtown Waxahachie. The sun grew hotter and the humidity worsened. Consequently I have little to say about this one. The quality of light was such that I had trouble separating the trolley from the building behind it. Both were in the same value range, and I just couldn’t seem to fake it by inventing shadows and such. I usually stay pretty true to what my eye can see. At any rate, I guess it’s better to have a watercolor than not to have one. It’s my sixth watercolor now in four days. I feel like a bricklayer, I’m so tired as I type this. 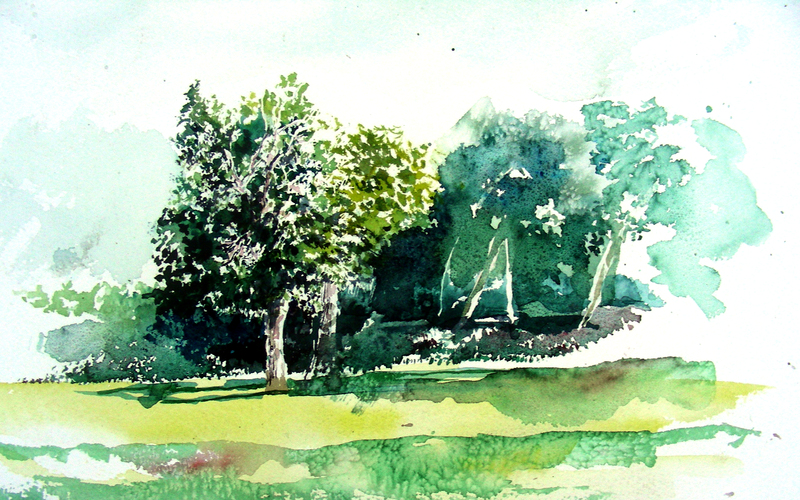 The heat, humidity and constant watercoloring and daily drives to and from Waxahachie are beginning to wear me down. I hope I’ll find some stamina and continue pushing these out (but I would like for them to improve!). Nevertheless, I do indeed look forward to tomorrow’s plein air adventure. Unfortunately, I have to go to school first. Another extremely hot and humid day in Waxhachie. I started this one in the shade, and 2 hours, 45 minutes later, the shade was leaving me. I never did feel cool air from 9:00-11:45 this morning. Bummer. This one was extremely experimental for me. 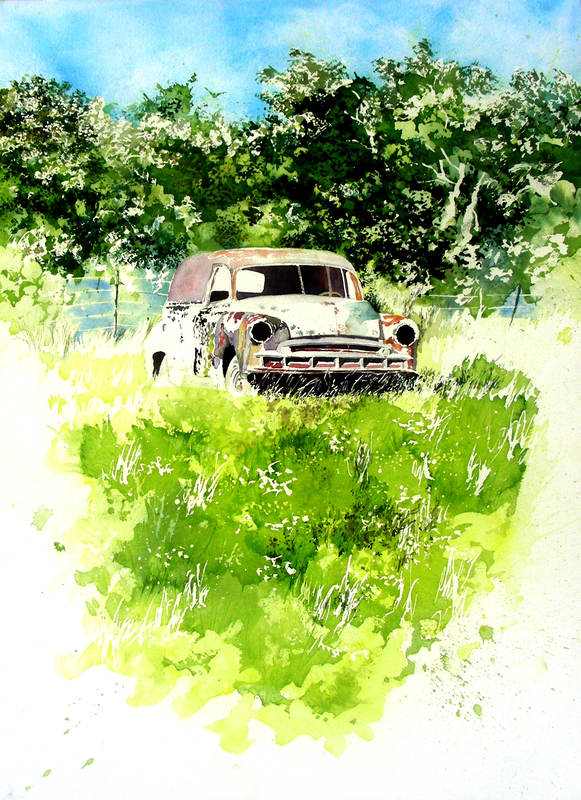 I painted this car before in my studio (with air conditioning). It is titled “Waxahachie Blue” and appears on my website http://www.recollections54.com. It sold immediately, and I have done reasonably well selling limited edition giclees and greeting cards of the image. Today however, I decided I wanted to try and capture the car at this three-quarter angle, and I wanted to darken the art gallery behind it. I spent about 25 minutes drawing just the car (I don’t draw automobiles very well, especially in three-quarter). Then I had to plumb in the architecture behind it. So finally, when I began to paint, I was already intolerably hot, and the wet-on-wet I worked into the background got completely out of hand in a hurry. I went ahead and threw plenty of salt at it to see how the pigments would break up. I also dropped water on the dry work to see how the backwash would work. After I finished my second hour on the work, the car had all but disappeared into the building. So, I sat it aside in the direct sunlight, waiting for it to dry out completely, then I worked very carefully and controllingly, trying to re-separate the car from the dark gallery behind it. Once I got that done, I decided to sign off and go look for lunch. The best thing that came of this frustrating experiment was the pleasure of meeting with Gaylord O’Con of the Southwestern Watercolor Society (I met him in McKinney at a paint-out several weeks ago) and learning of Quiller Watercolor pigments. I’m really intrigued by what he told me and can’t wait to check these out. Hopefully I’ll have opportunity to paint with Gaylord soon. His work this week at the Paint Historic Waxahachie event has been extraordinary. I had my “Edward Hopper” moment this morning as I cruised Main Street in Waxahachie, Texas, searching for something to paint en plein air. 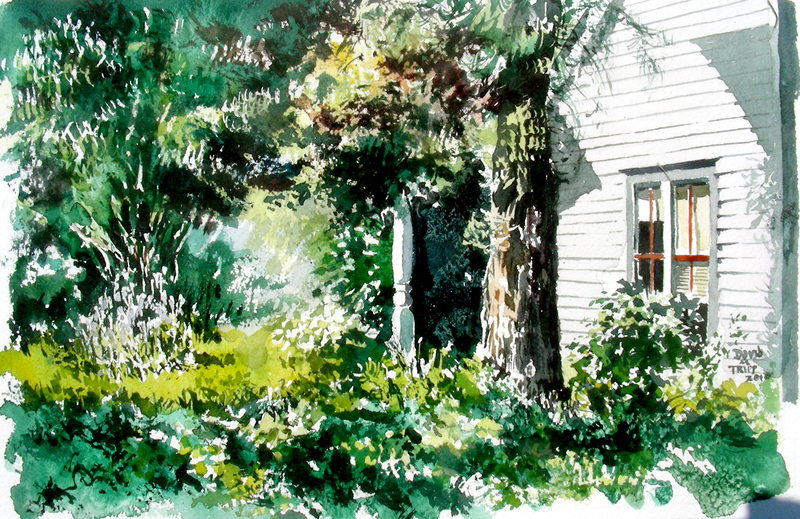 I saw the facade of this vacant house peeking out from the heavily shaded foliage of the trees out front, and I had to leap out of the Jeep and try to capture it. Thirty minutes into the experience, the sun found me. Like a stooge, I failed to note that I was seated on the western side of the trees that had formed such a nice canopy over my sidewalk. Thanks to the width of Main Street, I realized to my chagrin that I would spend the rest of the time under the sun. The temperature rose into the high 90’s and the humidity was fierce. I developed a headache. Two hours and fifteen minutes into the project, I decided that I had done about all I could do without becoming sun-sick. I’m glad at least I used sunblock while I was out in it. I would like to return to a subject such as this, and spend more time developing the foliage overhead and flowers underneath. I would have done it today, but alas, I’m a wimp when it comes to Texas heat. Thanks for reading. I decided to call it a day after this one. 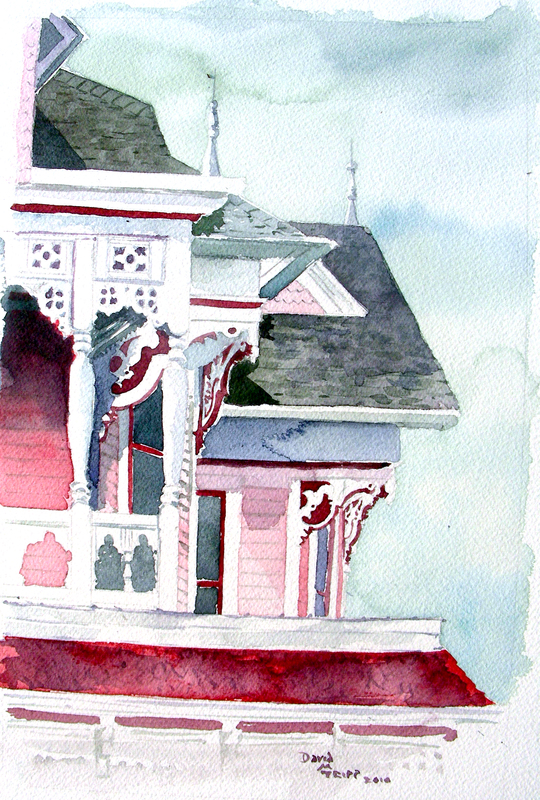 I’ll begin again in the morning when it is cooler, and see how many watercolors I can get done as the day unfolds. Today was just too hot and miserable for quality painting. After a 90-minute Quick Draw competition, followed by by a 30-minute cataloguing session, followed by a 90-minute auction, followed by a one-hour lunch, chat, and paperwork on recent paintings at the Ellis County Art Association, Chris Toplyn and I drove over to West Marvin Avenue and took a good look at this gorgeous historic Victorian home. We decided to give it a shot. I had no idea what I was climbing into! I drew for 45 minutes (doing more erasing than drawing!). Then I began laying down the washes, finally the dry brush detailing. The humidity and 97-degree afternoon was sweltering in the shade! However, the fabulous residents of this home came out and treated Chris and me as though we were royal guests, with cold drinks, fabulous conversation and very encouraging affirmations. Our heart-felt thanks goes out to Rudy Mikula and his wife Jackie Montejano. They really made us welcome. After three hours, I decided that I had gone about as far as I could with this one. With cooler temperatures, a more comfortable stool (and minus all that flurry of morning activity!) perhaps I could have given this a couple more hours of scrutiny. I thoroughly enjoyed working on it. But alas, the fatigue factor. I rose at 7:00 this morning, and now sit here at 7:41 this evening, totally whipped. I can hardly see to type this. Thanks for reading. I can’t wait for tomorrow! I’ll post faithfully every day as I continue this Historic Waxahachie Paint Out. The Quick Draw event is now in the books. 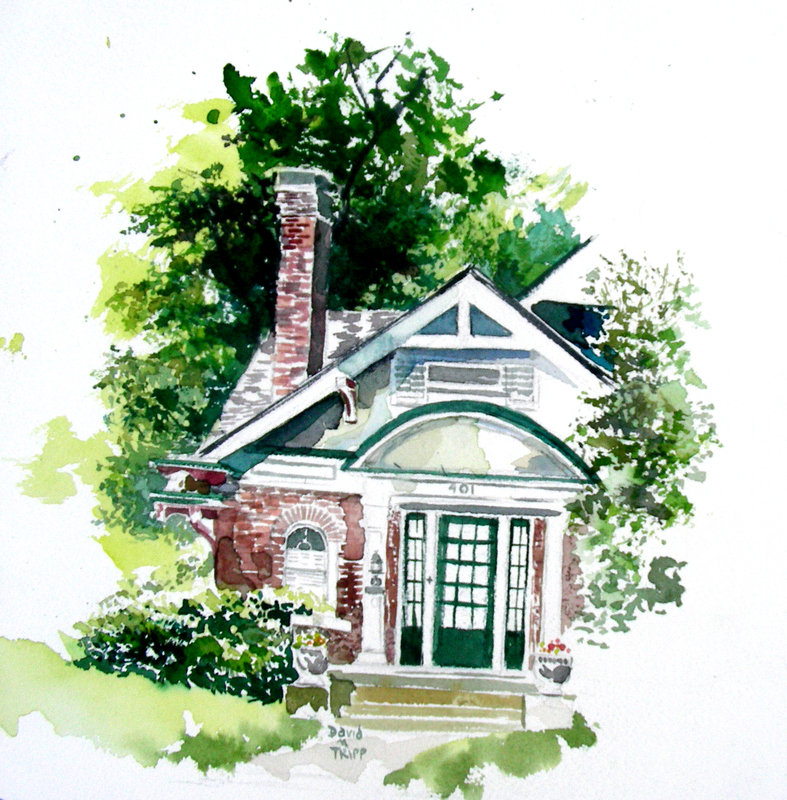 I was satisfied with this 90-minute watercolor sketch, 9 x 12″. It sold at auction for $60. I guess there are more dishonest ways to make money! I laughed in spite of myself as I made a few bloopers, trying too hard and working too fast. I could hear the growling, muttering voice of Cezanne–“composition off, colors wrong, errant hand!” Ten minutes into this project, the sun found me. I should have done a better job spotting the sun and shade tree above me. I had not idea that I was positioned to lose my shade so fast. So I sweltered through this whole thing. Glad I brough the sun block. Fifty-five artists have registered for the Paint Historic Waxahachie event, which will last until next weekend. I’m pretty beat right now, but hopefully will get enough quality sleep tonight to rise early and hit it again in the morning. 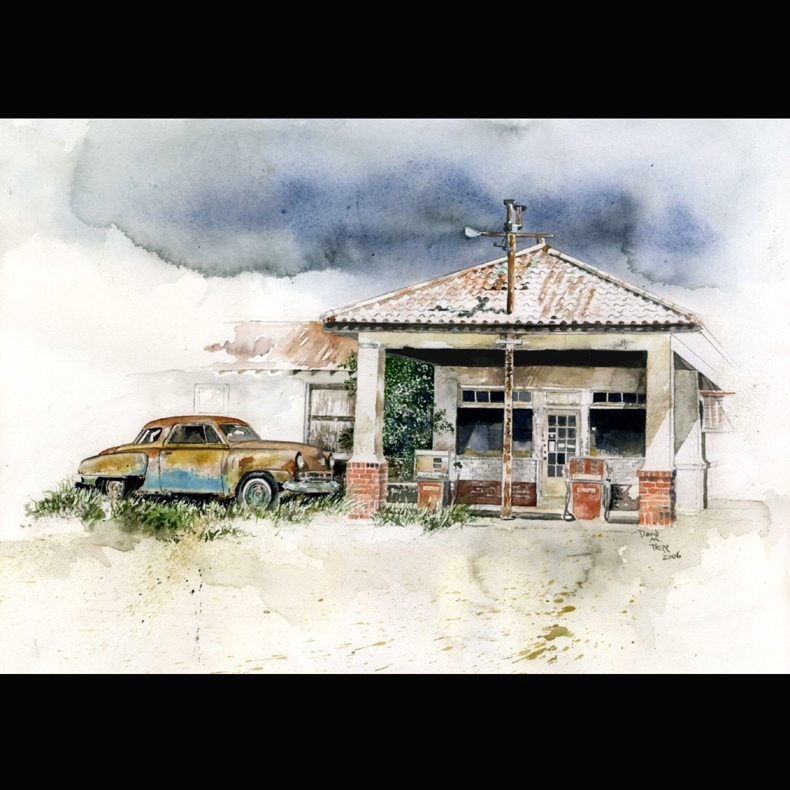 Ted Clemens of Saxie, Texas is an amazing oil painter. I had to capture this plein air sketch he was doing at the Waxahachie town square. I have found the Ellis County Courthouse an absolute monster to paint, but watching what Ted managed to capture on this day in the fading late afternoon light made my mouth water. I’ve waited a year to see his work, and cannot wait to watch it unfold during this next week. 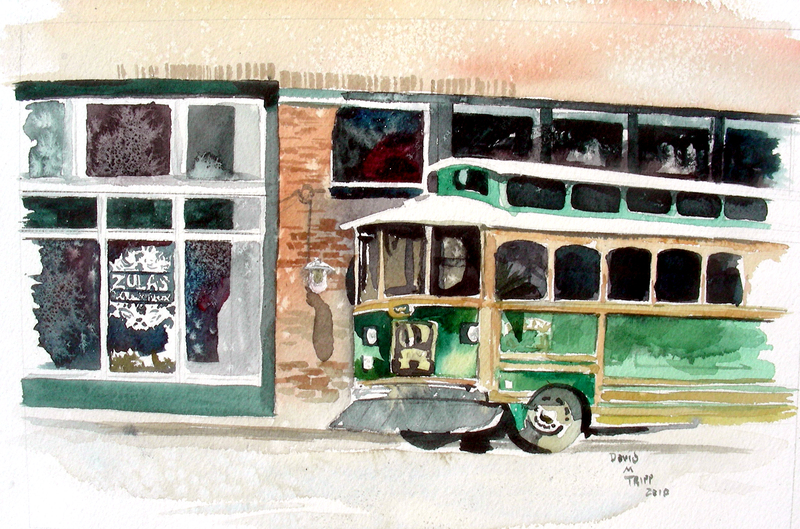 Tonight I won 2nd place in the watercolor division of the Desoto Art League annual juried show. This gas station I found in Claude, Texas. The Studebaker was abandoned in New Mexico. The genre of this piece reflects a theme I followed for about a decade–memories of places long since abandoned. 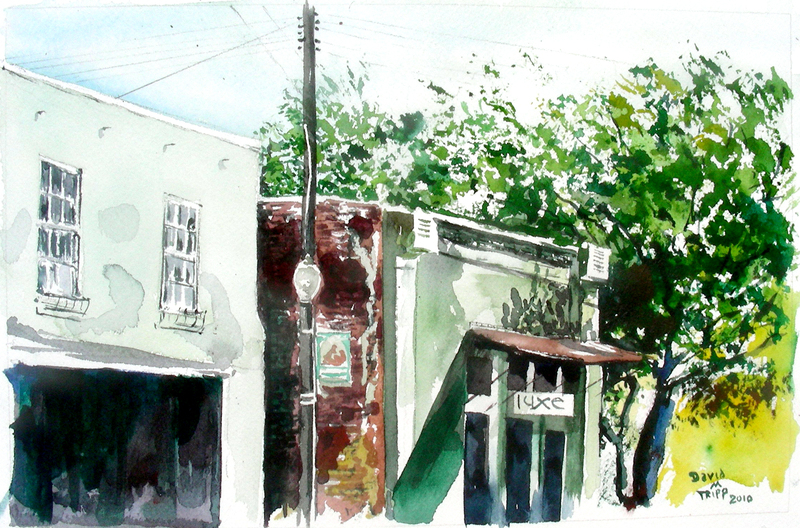 The first day of the Paint Historic Waxahachie plein air event is in the books. Eight days to go! The sun was bright, and though I got rained on for five minutes, the exercise was rewarding. This is a 9 x 12″ sketch that I worked on for two hours. I felt quite rusty, and had a great deal of trouble drawing and redrawing the architecture (I failed to bring along a straightedge!). But, once I got to the painting portion, I settled into it and didn’t realize how much time had passed. I had to close up my outdoor shop early, because I had an art reception to attend that was 30 minutes north on the freeway. 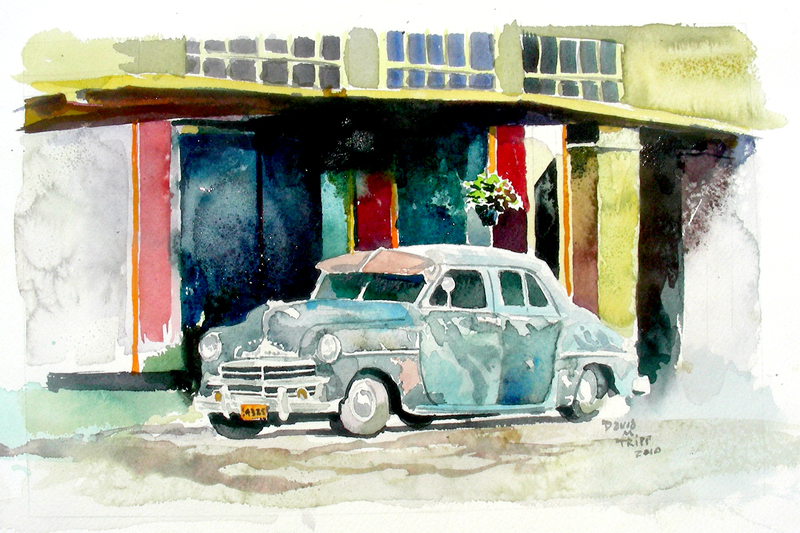 Glad I went–I took second place in the watercolor division. I’ll post that one separately. I am bone-tired. Rose at 5:00 and went with my wife to doctor her sick horse. Then to high school for a day. Then to Waxahachie to paint. Then to Hillsboro to the art reception. Now I’m going to finish these blogs, and get ready for bed. It’s already nearing 8:30 and I have to rise early for tomorrow’s official opening of the plein festival with a 90-minute “Quick Draw” competition. Tomorrow begins the “madness.” I’m going to join the company of Captain Ahab in search of the white whale, or Dean Moriarty in search of kicks, or Jack Kerouac On the Road, or Claude Monet chasing the fleeting light, or Paul Cezanne seeking a solid form beneath the changing colors. 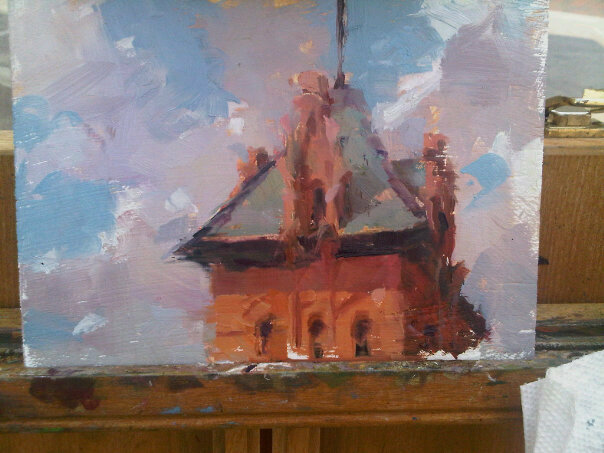 Tomorrow begins an eight-day plein air extravaganza in historic Waxahachie, Texas. Tomorrow afternoon I will set up and paint somewhere near the courthouse. On Saturday morning I will participate in the Quick Draw inauguration (90 minutes to produce a painting that is then auctioned on the courthouse square). Following the eight-day event, I’ll set up a booth for the Historic Mansfield Art Festival. Two days later, I’ll begin teaching a one-week plein air watercolor class at the Eureka Springs School of Art in northern Arkansas. To all my readers–I’m sorry the school schedule buried me once again. But I assure you, I will be posting daily throughout this plein-air event that begins tomorrow. As to the picture posted, I’m not sure when I’ll return to it in the studio. I’m glad watercolor doesn’t have a shelf life. Today I note with sadness that today marks the 100th anniversary of the passing of Alice Hochaday Monet, Claude Monet’s 2nd wife. She urged him to “cling to his palette.” So, after school today, I set off with my painting comrade Chris Toplyn and we took a look at Deaver Park during the setting sun. The winds were unforgiving, blowing everything over, and flapping our watercolor pages. But we enjoyed the quiet and the excitement of a landscape lighting up before our eyes.